Zenobia is the company, the Purse Charms are part of their Lina Lina accessories line. Designed by Lina Shehayeb and made in New York, purse charms are gemstone, crystal and glass beads dangling from a toggle clasp. Hook them onto your handbag, belt loop, keychain...or bell pull, curtain pull, lamp chain...be creative! Why Zenobia? Lina has been enchanted by the Queen of the Palmyrene Empire in the 3rd century middle eastern region, who was an accomplished ruler, philosopher, socialite and matron. Zenobia was beautiful, intelligent, cultured, brave and daring...a personification of all of woman's possibilities today! Here is the main way Lina envisioned that you can use your Purse Charm! But you can hook it onto anything with a ring...like belt loop, lamp or bell pull, keychain! 8-1/4 inches long including silvertone clasp. The colors are aqua, sapphire blue and turquoise. There are crystals in pacific opal, aqua and sapphire blue, turquoise gemstone nuggets, crystal flower charm, Turkish eye bead and crystal clusters. 9-1/4 inches long including goldtone clasp. The colors are fuchsia, rose and lapis blue. There are crystal colors in sapphire, clear and rose colors. Golden charms of flowers and key. Large round disk of a dyed quartz. Crystal charms of hearts and flowers, crystal nuggets, and a nugget of a fuchsia color gemstone. 7-3/4 inches long including silvertone clasp. The colors are blue including navy, sapphire, aqua and some purples. There are crystals and art glass, crystal nuggets, charms of flowers, enamel high-heel sandal, handmade hand. 8-1/4 inches long including goldtone clasp. The colors are navy and sapphire blue. Golden charms of enamel flower, crystal stars and flowers, coin and hand-made, rhinestone clusters. 7-3/4 inches long including silvertone clasp. The colors are turquoise, rose and green. There are nuggets of turquoise gemstones, art glass and crystals. 8-1/2 inches long including goldtone clasp. The colors are rose, purple and lavender. There are large flat faceted gemstone in rose with golden border, nuggets of amethyst, rough quartz, crystals, handmade charm, purple stone nuggets. 9-1/4 inches long including goldtone clasp. The colors are pastel aqua, green and lavender, purple. There are two large gemstone pieces in watery shades, crystals and art glass, flower charm and crystal cluster balls. 7-3/4 inches long including goldtone clasp. The colors are purple, voilet, orchid and lavender. There are chips of purple gemstones, unusual and interesting crystals, dyed pearls, rhinestone crystal balls. 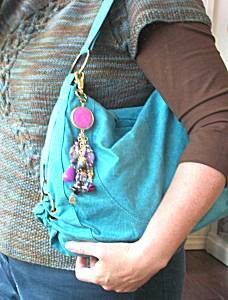 Read about what others think of Zenobia purse charms and necklaces! Instead of reviews for a specific product, this is a place to share about the designer line in general.